Immersive theatre appears to be a flourishing trend on the contemporary British scene. The events which are labelled as such all share the intention of “[placing] the audience at the heart of the work” (Josephine Machon) and abolish the distinction between stage and auditorium to merge them into one single space. This type of theatre questions not only the status of the spectator, redefining his/her place and role, but also the notion of ending. This article examines the work of the British company Punchdrunk which can be considered a “pioneer” in the field and which creates expansive environments that the “immersants” are free to explore as they wish. In these shows, the spectators are no longer placed in front of a narrative unfolding in a linear way with a beginning, a middle and an end. Invited to roam free through the performance space, they take individual journeys and discover the different scenes as they go along and happen to come across them. Such a radical change of perspective invites us to reconsider the very notion of ending and to think of it not so much in temporal terms, as the last stage in a teleological progression, but to look at it from a spatial angle. The driving force of the shows itself reveals a shift from the temporal to the spatial: “The moment-to-moment ‘what happens next?’ of conventional narratives is replaced by the ‘where is he going?’ and ‘what’s in the next room?’” (Gareth White). The end of the game, therefore, is not to passively wait for the narrative to unfold to its end, but to actively explore this terra incognita in an attempt to reach its edges. As the size of the performance space makes it impossible to see it all in one night, the temporal end of the show is inevitably frustrating for the immersants. They tend to gather — physically or online — after the performance in order to share their respective experiences, to try and piece together the narrative puzzle and map out the space. Punchdrunk’s shows thus go beyond their temporal boundaries and one can wonder when — and if — the immersive adventure truly ends. Le théâtre dit “immersif” apparaît comme une tendance florissante dans le paysage théâtral contemporain britannique. Les pièces/expériences de théâtre auxquelles ce terme s’applique placent le spectateur au cœur du dispositif en abolissant la distinction entre scène et salle pour les fondre en un espace unique. Ce type de théâtre interroge non seulement le statut du spectateur, redéfinissant sa place et sa fonction, mais également la notion de fin. Cet article se fonde sur le travail de la compagnie britannique Punchdrunk, pionnière dans le théâtre immersif et dont les productions se présentent comme de vastes environnements à explorer librement. Au sein d’un tel dispositif, le spectateur n’est plus placé face à un récit qui se déroulerait de manière linéaire avec un début, un milieu et une fin. Invité à déambuler à sa guise, il trace un itinéraire personnel et découvre les différentes scènes au gré de ses pérégrinations. Un tel renversement des perspectives nous invite à penser la fin non plus tant en termes temporels, comme la dernière étape d’un cheminement téléologique, que d’un point de vue spatial. En effet, le moteur-même de la représentation opère un glissement du temporel au spatial: « The moment-to-moment ‘what happens next?’ of conventional narratives is replaced by the ‘where is he going?’ and ‘what’s in the next room?’ » (Gareth White). Il s’agit dès lors pour le spectateur animé d’une volonté de ne rien manquer, de se lancer dans l’exploration de cette terra incognita dans une tentative d’atteindre les confins de cet espace. La fin temporelle de la représentation génère inévitablement une frustration pour le spectateur: celle de ne pas avoir eu le temps de faire le tour, au sens littéral comme au figuré, de la pièce. Le corps collectif théâtral, atomisé lors de la représentation, tend à se reconstituer dans l’après de la performance afin de mettre en commun les différentes expériences pour tenter de cartographier le « plateau-terrain » et de reconstruire le puzzle narratif. Le spectacle déborde ainsi de son cadre et la question se pose alors de savoir à quel moment l’aventure immersive prend véritablement fin. Since 2000, the company has pioneered a game changing form of theatre in which roaming audiences experience epic storytelling inside sensory theatrical worlds. Blending classic texts, physical performance, award-winning design installation and unexpected sites, the company’s infectious format rejects the passive obedience usually expected of audiences. 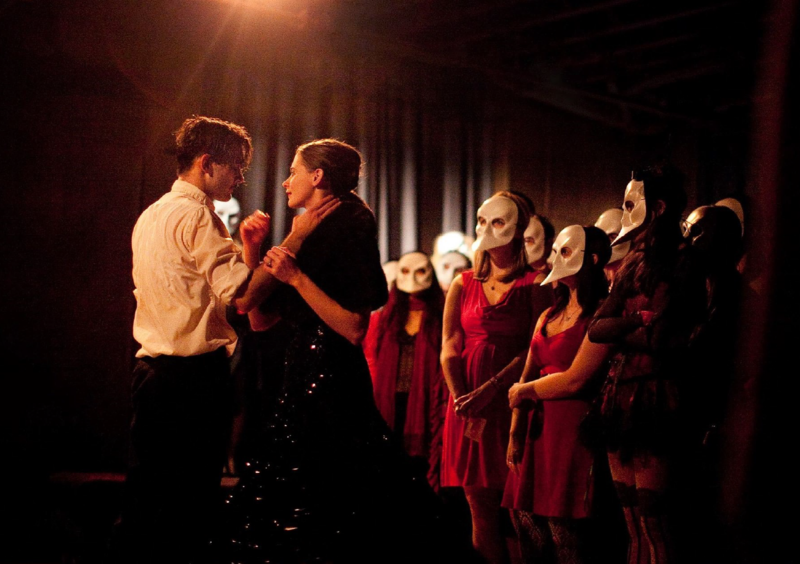 Punchdrunk has developed a phenomenal reputation for transformative productions that focus as much on the audience and the performance space as on the performers and narrative. Inspired designers occupy deserted buildings and apply a cinematic level of detail to immerse the audience in the world of the show. 2Punchdrunk’s venture could thus be read as a reaction against traditional forms of theatre where a clear line is drawn between the fictional story presented on stage and the spectators who are “passively” — in the sense that they remain physically static despite a possibly intense cerebral activity — seated in the darkened auditorium. Located at the crossroads between theatre, performance, dance and art installation1, Punchdrunk deconstructs the conventional format to create a “theatrical world” which the spectator can physically enter, literally stepping into the world of fiction, hence the playfulness and “excitement” surrounding the experience. 3At the beginning of their shows, the spectators are given a mask and a few instructions before being set free in the performance space, where they have complete freedom to choose what to do: they can decide to follow a specific character in the play or go and explore the fictional world on their own, going wherever they want, opening drawers, reading letters that they might find there, etc. With such an experimental and experiential type of theatre, the spectator is no longer placed in front of a narrative which would unfold in a linear way with a beginning, a middle and an end, as in a traditional play. Being invited to roam free through the performance space, they take individual journeys and discover the different scenes as they go along and happen to come across them. Such a radical change of perspective invites us to reconsider the very notion of ending and to think of it not so much in temporal terms, as the last stage in a teleological progression, but to look at it from a spatial angle as the physical exploration of the space all the way to its edges. 4This article explores the ways in which Punchdrunk’s shows cause temporal and spatial boundaries to become porous, to the extent that it becomes difficult to think of time and space separately; rather we have to consider them as being tightly related. 5The paper focuses on three productions by Punchdrunk: Sleep No More (2003), The Masque of the Red Death (2007-2008) and The Drowned Man: A Hollywood Fable (2013-2014). Following the original London production of the first show, an adaptation of Shakespeare’s Macbeth with a tinge of Hitchock, it was transferred to Boston in 2009 and to New York in 2011, where it is still playing today, and a new production of the show opened in Shanghai in November 2016. The Masque, based on Edgar Allan Poe’s Tales of Mystery and Imagination, was staged in London at Battersea Arts Centre while The Drowned Man, a creation inspired by Woyzeck, the unfinished play by Büchner, was staged in a disused Royal Mail sorting office near Paddington station, the performance space spreading over four floors. 6Working on such an unconventional type of theatre raises theoretical issues. Indeed, one cannot analyse it in the same way as they would text-based theatre. Josephine Machon underlines this difficulty in her seminal book on immersive theatre, (Syn)aesthetics: Redefining Visceral Performance. She shows that the critical tools used for the analysis of a theatre characterized by an "intellectual and literary style" cannot be applied to immersive performances. The critic needs to resort to a new analytical approach that would take into account the specificity of this radical type of theatre she calls "(syn)aesthetic work", which "shifts between the sensual and the intellectual, the somatic, (’affecting the body’ or ’absorbed through the body’) and the semantic (the ’mental reading’ of signs)" (Machon 2009: 4). This article therefore undertakes an analysis of Punchdrunk’s work based on a description of its sensual and somatic aspect. It also draws on a personal account as well as those of other people’s experiences of the shows. 8This account of a personal experience highlights how the individual adventure ultimately turns into a collective celebration and it underlines the conventionality of the final scene in which the theatricality of the event is laid bare4. 9Such a finale, clearly codified as an ending, would be expected at the end of a narrative unfolding in a linear way, and for this reason it appears at odds with the rest of the Punchdrunk experience. Indeed, the plot of their shows is built through the immersant’s personal and random wanderings throughout the space. In this respect, they differ from promenade theatre where the “spectators” follow a preconceived path that takes them through ordered stages before reaching the end (somewhat similar to the experience of walking through an Ikea store). 10In a Punchdrunk show, the narrative grows organically, taking the shape of an arborescence. The different storylines – one for each character – follow their own directions, overlapping from time to time. The plot thus unfolds both horizontally – the characters’ pathways – and vertically – the superimposition and crossing of all these journeys. 11The experience of the immersant is therefore not one of linearity, but of fragmentation. Even if they decide to follow the same character through his or her entire loop, they will still miss a major part of the show and the journey itself may be interrupted. In my own experience of Sleep No More in New York, I remember following one of the characters until he opened a door, stepped through to the other side and, with a sarcastic smile, slammed it in my face. As I had no idea when and where he would reappear in the building, I could not follow the rest of his loop. Furthermore, it is physically impossible for a member of the audience to follow each one of the twenty or so characters in one night, rendering the experience necessarily partial and personal. 13The finale of the show therefore gave Biggin the jarring impression that there was such thing as a whole story that the immersants were supposed to piece together during their experience. The selling of a “guidebook” at the end of Sleep No More also plays into this idea. Cultivating the frustration of the audience and the “mystery” surrounding the story behind the show can be considered a way for the company to “trap” the immersant and encourage them to come back in order to try and solve the narrative “puzzle”. 16The artistic director’s comments reveal how influential space is to the work of the company which has been described as “site-sympathetic” (Machon 2007). This idea is sustained by the artful rhetoric of Punchdrunk. By declaring that they “[allow] the building to inform [their] decisions”, Felix Barrett conveys the sense of things unravelling “as if by themselves” in the process of creation, which perfectly fits with the “organic” and instinctive experience that the company strives to foster. 17These comments on the use of the ballroom also make it clear that the ending of the show cannot be thought of independently of space. The end of the “narrative” is the discovery of this ultimate room and the “crescendo” which underlies the structure is first and foremost a spatial one: “the crescendo of the building”. 18While the ending of a Punchdrunk show may convey a deceptive feeling of teleological completeness, it also reflects the substantial link between time and space which is established and experienced in these theatrical events. 19Not only does space play a central role in the work of Punchdrunk, it also is what is offered to the audience. Their shows are indeed conceived as expansive environments in which space becomes, to borrow Antonin Artaud’s words, "a tangible, physical place"5 and the narrative as a cartography one wanders through and explores. 23The mask conveys the impression that the immersants are themselves part of the installation, of the setting. Josephine Machon notes that "through the masks, they become "ethereal beings" that haunt the event, part of the scenographic design" (Machon 2013: 73). 25This dissection and scattering of the text in space is an integral part of the aesthetics of Punchdrunk’s shows which are remarkably textual. Not only are they based on classic texts but literary references proliferate, such as in The Masque of the Red Death where a shadow puppet show based on The Fall of the House of Usher, another of Poe’s short stories, was performed in a shadow puppet theatre. The act of writing and reading is also found at the level of the performance: performers write letters which the audience can then read, they give them notes, etc. The immersants are thus envisioned as readers, a paradoxical practice that William Worthen underlines in his article "‘The written troubles of the brain’: Sleep No More and the Space of Character". As members of the audience, he explains, "we write our individualized plotlines in our own movements, but are constructed within the spectacle as realist voyeurs, watchers, and readers, not agents." (Worthen: 96). Worthen interprets this in the light of Harry Berger’s dichotomy of reading versus seeing plays: "[u]nlike actors or directors bound, in Berger’s view, to the temporal order of performance, readers are "free to explore the umbrella potentiality of words by uncoupling them, abstracting them, and holding them over the play or transferring them to another speaker," or indeed to another material object" (86). Punchdrunk’s shows could therefore be considered a literalisation of the act of reading — in Berger’s sense — underlining the predominance of "networked spatiality" over "linear teleology" (McGinley: 12). 26Theatre both is and inhabits a place that stands apart from the real world — what Foucault calls heterotopia. In a conference he gave in 1967 entitled “Of Other Spaces”, he defined heterotopias in relation to utopias. While the latter refer to sites that do not exist in reality7, the former are anchored in a real place8. Heterotopias can be conceived as counter-sites, alternative spaces — such as psychiatric hospitals, prisons, cemeteries, gardens, libraries, museums, fairgrounds, vacation villages, cinemas and theatres — that are to be distinguished from ordinary sites in that they establish and frame a world of their own in which the rules and relations of the normal order are suspended, “neutralised” or “inverted” (Foucault: 24). 27Punchdrunk goes further than traditional theatrical heterotopias by creating, through the attention to detail in particular, the illusion of an alternative reality which occupies the whole performance space, thus setting up what feels like an entire fictional world that the immersant can inhabit for the duration of the show9. This relates to what Josephine Machon calls the "in-its-own world" quality (Machon 2013: 93), one of the specific elements which are, according to her, identifiable within any immersive experience10. 30The geographical limits of the performance space remain indeterminate for the spectator. The end of the game, therefore, is not to passively wait for the narrative to unfold to its end, but to actively explore this terra incognita, to map the fictional world and push the frontier to its edges11. 31Thus, space is not only the core of the show, but it is also crucially its driving force. It is the desire to reach the boundaries of this physical space coupled with the drive to see what happens elsewhere at the same moment that impels the immersants to move from place to place: “the feeling that there is more to see in the next room,” notes Gareth White, “and that there is always a danger of missing something, propels this movement. The moment-to-moment ‘what happens next?’ of conventional narratives is replaced by the ‘where is he going?’ and ‘what’s in the next room?’” (White: 224). 34In Punchdrunk’s shows, heterotopia and heterochrony go hand in hand since time is perceived in relation to space. This association of the two concepts reflects the cognitive conception of time. 35In their book Philosophy in the Flesh: The Embodied Mind and its Challenge to Western Thought, cognitive linguists Lakoff and Johnson develop the theory of the "embodied mind" stating that our thoughts and concepts are shaped by primary metaphors based on everyday bodily experience13. Among other notions, time is apprehended through spatial analogies: "Most of our understanding of time is a metaphorical version of our understanding of motion in space" (Lakoff and Johnson: 139). Similarly, the perception of the structure of narratives composed of a beginning, a middle, and an end derives from the "Source-Path-Goal Schema" (32) which in turn comes from the experience of moving from a starting point to an end point. 36Punchdrunk’s performances could thus be considered a literalisation of the primary metaphor of time-as-space. An illustration of this is to be found in the beginning and ending of the shows which can be thought of not only as specific moments in time but also as physical spaces. Once again, Punchdrunk appears as a prime example of Foucault’s heterotopias: “Heterotopias always presuppose a system of opening and closing that both isolates them and makes them penetrable.” (Foucault: 26). These liminal spaces can be considered “decompression chambers” taking immersants from the real world to the world of fiction and vice-versa: “[W]e always establish an entrance point to the world we create which is like entering a decompression chamber, to acclimatize to the world before being set free in it” (Barrett quoted in Machon 2009: 91). The “entrance point” to the world of Sleep No More, for instance, is a 1940s hotel bar that the immersants reach after groping their way through a labyrinth plunged in darkness and where they get to spend some time before being given masks, taken into an elevator and being randomly allowed to exit at different levels of the performance space. This room establishes a link between the everyday world — people chat and have drinks with their friends as they would in the foyer of a theatre before the start of a show — and the world of fiction — some of the people there are actually actors and the bar itself is the replica of a run-down bar to be found in the performance space. The immersants find themselves in limbo; it is unclear to them whether the show has actually started or not. The space allows them to gradually adjust to the atmosphere of the world of fiction before they step into it. 37Similarly, at the end of the show, when the grand finale is over, people are led back to the bar where a band is playing; they take their masks off, sit at the bar and have a drink before returning to the real world. Daniel Schulze underlines the need — shared by other immersants — that he felt for such a space: “The bar and dancing in the end was very necessary as a “decompression chamber”. It helped you to slowly ease back into the real world” (Schulze: 175-176). 38However, the temporal ending of the theatrical event does not mark the end of the Punchdrunk adventure. Indeed, some immersants feel that they can only achieve true closure once they have explored the fictional world in its entirety — yet again linking space and time. As the size of the performance space makes it impossible to see it all in one night, this frustration encourages the audience to come back and experience the same show several times, underlining its addictive aspect — some people can go back over fifty times. Furthermore, audience members extend the world created by Punchdrunk through their sharing of their different individual experiences — what Josephine Machon calls their “embodied memory” — in an attempt to try and reconstruct the narrative puzzle. These discussions extend to the virtual sphere where numerous fan pages and Wikipedia pages are created in order to establish a collective inventory of the different scenes and maps of the performance space. 39Through the creation of expansive environments that immersants are free to explore as they wish, Punchdrunk thus invites us to reconsider the very notion of ending. Onto the temporal end of the show is superimposed a spatial one, and the experience can only truly be brought to an end once the spectator has attained the far reaches of the fictional territory, looked into every nook and cranny of the set and attended the various scenes that happen simultaneously in different parts of the building. In other words, the experience of a Punchdrunk show can never really come to an end. ARTAUD, Antonin (translated by Victor Corti). “The Theatre and its Double” in Collected Works: Volume Four. London: Calder & Boyars, 1974. BABBAGE, Frances. Adaptation in Contemporary Theatre: Performing Literature. London: Bloomsbury Methuen Drama, 2018. BIGGIN, Rose. Immersive Theatre and Audience Experience: Space, Game and Story in the Work of Punchdrunk. Basingstoke: Palgrave Macmillan, 2017. GEERAERTS, Dirk. CUYCKENS, Hubert (Ed). The Oxford Handbook of Cognitive Linguistics. Oxford: Oxford University Press, 2010. LAKOFF, George. JOHNSON, Mark. Philosophy in the Flesh: The Embodied Mind and its Challenge to Western Thought. New York: Basic Books, 1999. MACHON, Josephine. Immersive Theatres: Intimacy and Immediacy in Contemporary Performance. Basingstoke: Palgrave Macmillan, 2013. MACHON, Josephine. (Syn)aesthetic: Redefining Visceral Performance. Basingstoke: Palgrave Macmillan, 2009. MCGINLEY, Paige. “Next Up Downtown: A New Generation of Ensemble Performance”. TDR: The Drama Review, 54(4), 2010, pp. 11-38. MCROBERT, Laurie. Char Davies’ Immersive Virtual Art and the Essence of Spatiality. Toronto: University of Toronto Press, 2007. RYAN, Marie-Laure. Narrative as Virtual Reality: Immersion and Interactivity in Literature and Electronic Media. Baltimore: Johns Hopkins UP, 2000. SCHULZE, Daniel. Authenticity in Contemporary Theatre and Performance: Make it Real. London: Bloomsbury Methuen Drama, 2017. Sleep No More’s Souvenir Program (second edition). New-York: Arkadia & Co, 2012. WHITE, Gareth. “On Immersive Theatre”, Theatre Research International, 37, 2012, pp.221-235. WORTHEN, William. “‘The written trouble of the brain’: Sleep No More and the Space of Character”, Theatre Journal, 64(1), 2012, pp. 79-97. 1 As such, the company includes a choreographer, Maxine Doyle, who is also associate director, and design associates Livi Vaughan and Bea Minns. 3 The first use of the word is attributed to Char Davies, a Canadian artist who coined the term to refer to people who experienced her digital installations (see McRobert). 4 For an illustration of Punchdrunk’s closing scenes, see the excerpt of The Drowned Man’s finale available on Youtube <https://www.youtube.com/watch?v=P90RHykUpyg> (accessed 19.05.16). 6 However, the performers themselves may sometimes don a mask to navigate anonymously among the spectators and there is a temptation as an immersant to take it off and see if you will be mistaken for an actor and start being followed by other immersants. 9 In this respect, it is interesting to note that immersants frequently steal small objects from the set in order to bring pieces of this heterotopia back to the real world with them, thus pushing the metalepsis even further. Likewise, people are often given a piece of memorabilia, such as a ring, at the end of a one-on-one. 10 Along with the "in-its-own world" quality, she identifies space, scenography, sound, duration, interdisciplinary practice, bodies, audience, and a contract for participation. 11 However, each spectator, and therefore their experience of the show, is different: some may not seek to discover everything, but simply enjoy the musing quality of the space. It is frequent as an immersant to stumble on other members of the audience sat at a desk or in a comfortable sofa while reading letters or simply wandering through the maze of rooms. This echoes the pleasure of the labyrinth — walking around and getting lost in it can be as pleasant as trying to solve the spatial riddle, which inevitably marks the end of the experience. Déborah Prudhon is a PhD student and teaches translation, English and American literature at Lettres Sorbonne Université. Her thesis, supervised by Pr. Elisabeth Angel-Perez, explores the redefinition of the relationship between fiction and reality in the works of contemporary playwrights such as Tim Crouch and Dennis Kelly, as well as in Punchdrunk’s immersive theatre. Déborah Prudhon est doctorante à Lettres Sorbonne Université où elle enseigne la traduction et la littérature britannique et américaine. Sa thèse, dirigée par le Pr. Elisabeth Angel-Perez, explore la redéfinition de la relation entre fiction et réalité dans l’œuvre des dramaturges contemporains Tim Crouch et Dennis Kelly, ainsi que dans le théâtre immersif de Punchdrunk.